With each successive work, Clarice Lispector polished her prose until it shimmered with a taut irregularity. By Clarice Lispector; Benjamin Moser, trans. By Clarice Lispector; Alison Entrekin, trans. By Clarice Lispector; Idra Novey, trans. By Clarice Lispector; Stefan Tobler, trans. By Clarice Lispector; Johnny Lorenz, trans. By Clarice Lispector; Katrina Dodson, trans. Bishop was not the first translator, or reader, to have been mystified by the enigma that Lispector represented, on the page and in person. The riddle of her nonliterary self has been described, psychoanalyzed, even supposedly solved by so many readers as to become its own literary cliché. The essential question of Why This World, Benjamin Moser’s 2009 hagiography of “the Sphinx,” is how a woman so modern—one who even flew in airplanes! he adds—could remain so “fundamentally unfamiliar,” unclassifiable, and indecipherable to her own countrymen and few friends. She often wondered the same thing. “Why do I write? What do I know?” she asked in The Hour of the Star. “No idea. I seem to belong to a distant galaxy because I’m so strange to myself. Is this me? I am frightened to encounter myself.” In another work, another variation: “I am obscure to myself.” And so on. When her first novel, Near to the Wild Heart, appeared in 1943, it was compared to the fiction of Joyce, Woolf, and Proust—none of which, she told critics, she had previously read. (Her book’s title was taken from a line in Joyce’s Portrait of the Artist as a Young Man, on the suggestion of a friend.) Lispector’s unfamiliarity with the instant classics of an earlier generation might have been understandable given her age—she was an enviable 23 when her first novel launched her to stardom—but she maintained her aloof indifference, if not disdain, toward capital-L literature for the rest of her prolific career. Foreign. Unfamiliar. Nonliterary. Lispector wore these characterizations of her writing as medals of honor. With each successive work, she polished her prose until it shimmered with a taut irregularity, “like the successive shapes in a kaleidoscope.” Mute was her favorite word, after silence. “I write in signs,” she said, “that are more a gesture than a voice.” These gestures and signs shifted throughout her writings, but her obsession remained the same: approaching not the word, but the thing itself. Throughout her lifetime, the rumors persisted: Her name was a pseudonym; she didn’t exist; she was a liar, a diplomat, a man. Idra Novey, in the afterword to her recent translation of The Passion According to G.H., recalls a telling anecdote: A young woman, obsessed with Lispector’s work, is desperate to meet her. But when the young woman finally visits, Lispector sits silently in her apartment, staring and saying nothing, until the acolyte, terrified, flees. Novey’s anecdote of an anecdote resembles most of Lispector’s stories: a simple plot, prolonged by the author’s stubborn meditations on emptiness, God, mortality, and eternity—­in other words, an extended wrestling with the void where language is not. The action of G.H., for instance, occupies only a few pages: An upper-class sculptor enters her maid’s room, kills a cockroach, and eats its body as communion. The rest of the nearly 200-page novel is spent describing G.H.’s encounters with the horrors of time and death. The tale is typical Lispector. In her novels, often situated in the nonspace of philosophical dialogue, she doesn’t write characters so much as voices: sighing, screaming, exclaiming, transfiguring. Her narrators are perpetually loath to establish even the most threadbare of scenes, settings, or actions. They continually justify their distaste for narrative by resorting to one of several favorite conceits: their poor grasp of storytelling as a medium (the narrator is a sculptor in G.H., a painter in Água Viva and A Breath of Life); their disinterest in the story they’re telling (as the narrator repeatedly emphasizes in The Hour of the Star); and the ultimate poverty of language’s expressive powers (all). Nowhere is this distaste for the “psychological viewpoint” more evident than in Lispector’s short stories, collected for the first time in a complete English translation by Katrina Dodson. Almost always unnamed, the characters of these stories remain anonymous save for a fleeting transcription of their immediate subjectivities. Knowing just as little as we do, and getting that part wrong too, her protagonists are intensely sensitive to how little agency they have over the vagaries of their fate. These women are surprised by how suddenly they collide with their cathartic destiny—the story’s climax—and ashamed by the severity of the emotions, fantasies, and projections they display while doing so. Their lives read like emotional charts in a perverse astrology: psychically charged scenes filled with misplaced manners, instincts, and impulses. Plot, especially in Lispector’s “First Stories,” is a theatrical moment of personal revelation—a fire of insight that, given the moodiness of each first-person narrator, often burns out as quickly as it sparked. Sometimes action comes in the form of an extended gaze, and in an instant, everything changes. A short passage from one of Lispector’s earliest stories encapsulates the sudden, fitful movements of many others: “She often felt like crying, which generally was no more than an urge, as though the crisis spent itself in the desire. Some days, filled with boredom, peevish and sad. Other days, languid like a cat, becoming intoxicated by the slightest occurrences. A leaf falling, a child’s cry, and she’d think: one more moment and I won’t be able to bear such happiness.” The proliferation of these rapid sequences of suffering leads one character to imagine asking “the government to create a department of abandoned and sad women,” likely to house those in Lispector’s stories. In her second collection, Family Ties, her characters are somehow even more unwell than before, full of “sweet nausea” and “the dizziness of benevolence.” Even when the bourgeois familial trappings of her protagonists fit them well, they remain dissatisfied. In “Happy Birthday,” a matriarch’s hard-won 89th birthday ends in the revelation that she despises her entire family. In “Love,” a woman spots a blind man chewing gum on a train and collapses into a dissociated daze. When she returns home, she barely recognizes her own son. She realizes “she had fallen into a woman’s fate, with the surprise of fitting into it as if she had invented it. The man she’d married was a real man, the children she’d had were real children.” The hyperbole of the word “real,” of course, has the effect of modifying all of its objects into fakes. To Lispector, family, like femininity, is an imperfect impersonation of appearances— in her words, “the fragile product of many precautions and a handful of lies.” “False domestication,” an affect coined by Lispector in a vignette about horses, aptly names the alienation experienced by her characters, especially those who are married. In “A Chicken,” one of Lispector’s greatest stories about animals, a hen impervious to the respect that a human family accords her becomes “queen of the house. Everyone, except her, knew it.” With her “twin talents: apathy and alarm,” the chicken clucks between the terrace and the kitchen, until one day, in an act as sudden as her lucky adoption, she is killed and eaten for supper. So often with a hint of absurdity, Lispector abruptly kills her characters off as though they stumbled into the wrong tragicomedy, perhaps the author’s own. Her study of perversity reached its peak in The Foreign Legion, stories collected and published in 1964, the same year as The Passion According to G.H. The book opens with the story of a cruel and clever schoolgirl named Sofia. She tortures her lonely teacher, only to discover that he values her for exactly the qualities that she wishes to renounce. In her teacher’s misplaced kindness, “the way he offended me by believing in me,” Sofia sees the abyss of the world. His candid smile is transformed into something that “so little resembled a smile as if a liver or a foot were trying to smile.” She sees. As if my curious eye were glued to the keyhole and in shock came upon another eye looking back at me from the other side. I saw inside an eye. Which was as incomprehensible as an eye. An eye opened up with its moving jelly. With its organic tears. An eye cries all by itself, an eye laughs all by itself….Seeing hope terrified me. Unlike Borges, Lispector was not interested in literature, but in the failures of language to address the question of being. She stripped her work of literature, in order to write “the antiliterature of the thing.” Whereas Borges exalted the possibilities of writing about writing, Lispector searched impossibly in writing for the thing itself. In her least, and most, Borgesian story, “Report on the Thing,” she speaks “without literature” of “one particular clock.” The electronic clock, called Sveglia, operates like a curse, taking over the author’s life as she incants on its essence and, later, dies. Reading Lispector often feels like reading the light blocked behind a book—or, in divine terms, the light of the word itself. There is something nonsensical about the pleasure of surrendering to her prose, like kissing a stomachache. Her phrasings have all of the delicate transgression of being naked with oneself, and the entangled digressions of thinking with too much company. In a late story, “The Departure of the Train,” her main archetypes finally meet. A young girl full of romantic idealism sits on a train across from an old woman shamed by her advanced age. The former is traveling to her aunt and uncle’s farm to get over a recent breakup; the latter to her son’s farm, where she will spend the rest of her life. Both are frightened and alone. Time is too much with them, and they know it can’t be stopped. Writing to prolong a life at its end, Lispector increasingly writes in the creases of time. She produces an autophagic literature: “What I’m writing now is meant for no one: it’s directly meant for writing itself, this writing consumes writing.” Of her two final stories in this new collection, one tells of a day in the life of a woman who watches the clock all day, only to kill herself after dinner. Her last thought: a vague desire that her maid had left her a raspberry tart. Like the deaths of the blithe chicken and charming monkey before her, the woman’s abrupt death is at once sardonic and sad. It’s also surprising. 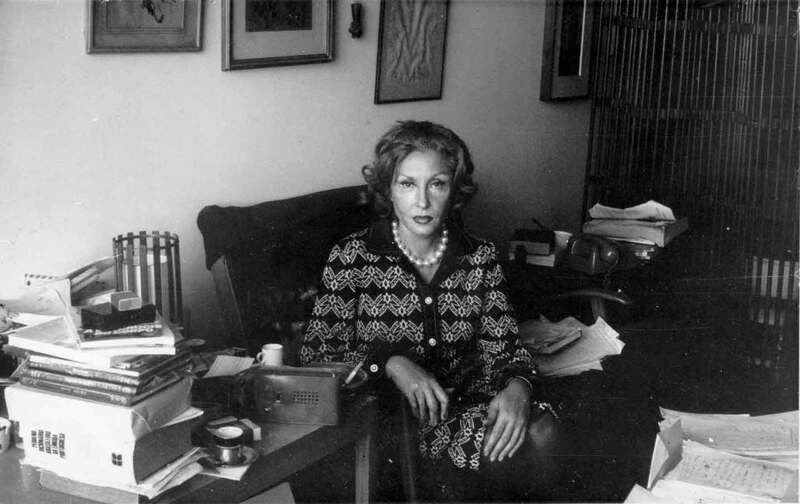 “I hope to die writing,” Lispector told an interviewer in 1976, after winning a national prize for a lifetime of literary achievement. In a sense, she did. Her final novel, A Breath of Life, was incomplete when she died on December 9, 1977, one day shy of her 57th birthday. The novel closes with three fragments, each a paragraph. Her last words do not end so much as they continue. An affirmation, a negation, an incomplete declaration: two apples and a chair.